Overview of Vivec - An overview of the largest city in Vvardenfell. Key - A description of the house details header. St. Olms Plaza, Haunted Manor - A rumored haunted and therefore abandoned place... or is it? St. Delyn Canal North-Two - A house occupied by two Dreamers in the St. Delyn Canton. St. Delyn Canal South-Two - A house owned until recently by Nads Tharen. Redoran Plaza Saren Manor - A house occupied by three commoners and a Noble in the Redoran Canton. Services: Services and establishments inside or next door to the house. Description: A detailed description of the house's features. Description: Creepy and with a gloomy atmosphere, the Haunted Manor offers a bed, three shelves, a table and even a balcony to make good use of. What it lacks in storage containers, it compensates with furniture useful for displaying items. 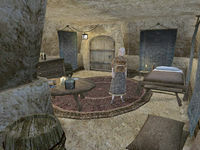 A good house for thieves and/or vampires, seeking a rather obscure residence to hide from public sight; Additionally, through a level 50 lock Dram Bero resides downstairs along with others from the house, making this a good choice for Hlaalu players. Description: This is a great house if you want somewhere to keep your stuff because items kept in this house will never dissipate over time. There is also a bed, two shelves, a table, a chest, and a wardrobe in this house. Creepy, though. The dreamers respawn when you re-enter after their corpses disappear. Brother Nads, in your new home. 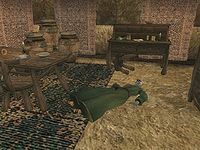 Description: South-Two is one of the few houses in the game with a permanent dead body, in this case that of Nads Tharen. Dead bodies don't have a storage limit, so you will always have a place to store your goods. The key on his body is required for a Thieves Guild quest. St. Delyn isn't close to any services other than the Temple, and it is a semi-far walk to the Mages Guild for the Guild Guide and the Silt Strider and boat services. If you're close enough to Vivec, Almsivi Intervention will take you just a few steps from your home. Or if you prefer, set your Mark while standing over Nads' body so that after plundering more than you can carry in a bandit cave or Dwemer ruin you can Recall and unload your loot on poor Nads. Divine Intervention will take you to the Ebonheart Chapel, which is handy if you're in the Imperial Cult or need access to their boat services. Storage: 4 barrels, 10 sacks and a dresser. Desription: Plenty of storage space, 4 barrels, 10 sacks, a dresser, tablestand, bed, footstool and a table with a chair. 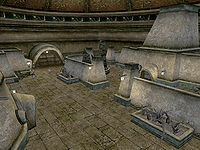 Redoran Plaza, Saren Manor bottom left. Description: This is a great house for those with lots of loot. The home is well-decorated and fairly large, consisting of three floors. The main floor includes two bookshelves, a banquet table and a bedroom. The master bedroom is up a ramp on the top floor. Down a ramp to the basement is a cozy area with a bed, a small table and closet. Behind this area is the cellar, where the majority of the storage crates are present. The basement has a trapdoor to the upper "apartment", which is cozy, and well furnished with a hammock. This apartment has a secret exit to the Plaza. All occupants in this house are unarmed and are not involved in any quests, except for a Morag Tong Writ for Toris Saren. Description: This is the bare minimum for decorations, but it has masses of storage. Located in the Arena Waistworks; with quick access to the Morag Tong Guild. This page was last modified on 4 August 2018, at 09:37.